Fiat Big Finish Sale Ending Soon! Dealers and owners are reporting huge discounts - usually over $2000 on Fiat 2 doors and $3000 off Abarth or Abarth Cabrio. At least $1000 on 500L up to $1500 off. The Fiat Big Finish Sale for 2013 is running only until Monday, 12/2/13... so make sure you get down to your Fiat Studio now! 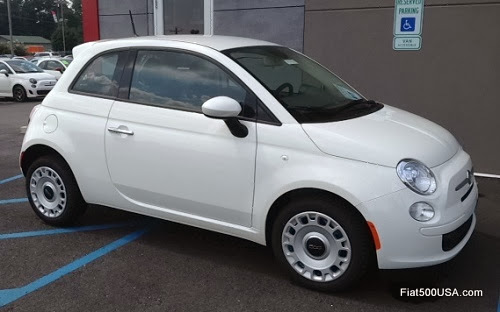 2013 Fiat 500 Pop: MSRP: $16900...discount with new $500 bonus is now $13,900 plus tax, tag, title. 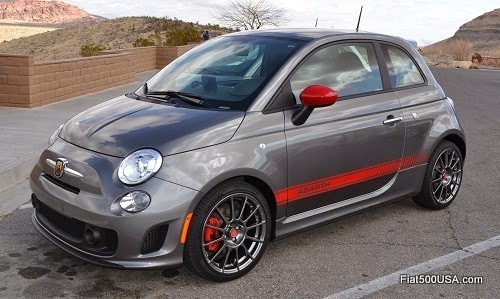 Abarth with Beats Audio/Leather Seats / 17" Hyper black wheels / Mirror caps and red Stripes MSRP: $25,250... discount with new $500 bonus is now $21,750. Contact the Fiat Studios below and get in on the savings! Follow the links to see the deals! *Incentives can vary from region to region so make sure you contact your local Fiat Dealer to find out what is current in your area. Abarth image not actual car for sale, but represents color and options.. 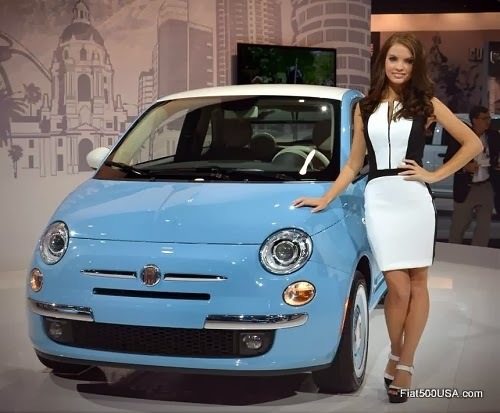 In the video posted below, Jason Stoicevich, Head of Fiat Brand North America, talks about the 2014 Fiat 500 models on display at the 2013 Los Angeles Auto Show. The 2013 LA Auto Show runs through December 1st. Make sure you visit the Fiat stand and see the updates for 2014. 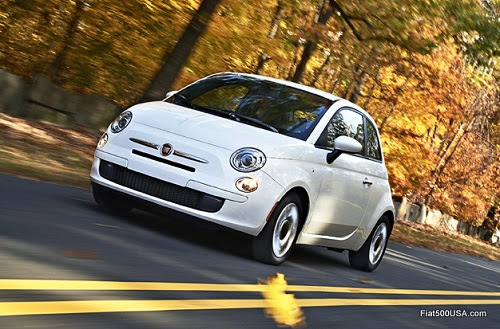 Visit the links below to learn more about the 2014 Fiat 500. Fiat has commissioned an artist to recreate the Michelangelo painting on the ceiling of the Sistine Chapel on the inside roof of a Fiat 500L at the LA Auto Show. The artist, Italian painter Nicola Verlato, will replicate the iconic masterpiece over the course of six days right on the show floor while the public watches. 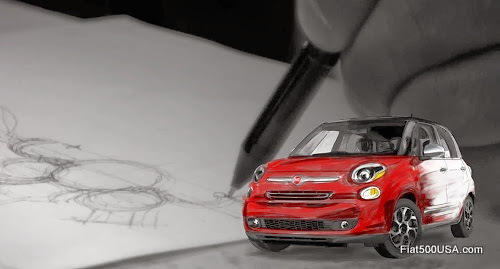 Fiat is doing this to showcase the advanced design and roominess of the 500L, a car that within its subcompact length has the interior room of a full-size car and tie in the heritage of classic Italian design, engineering and art that Michelangelo represents. Nicola Verlato, laying on his back and using oil and watercolor, will recreate specific scenes from the Sistine Chapel painting. Fiat will have daily updates so you can watch Verlato's work. Bookmark this post to see the progress. Last month, the Fiat 500L was put on display at the Gallery of Modern Art in Torino, Italy in a show that pays tribute to Renoir, one of the founders and leading painters of the Impressionist style. Light and color are the key elements of Renoir's painting philosophy and also the elements that make up the design of the 500L's interior. Special attention was payed to having a bright and airy pasenger compartment aided by the 500L's extensive window area. The shapes and colors used throughout the interior are also designed to evoke positve human emotions and feelings. 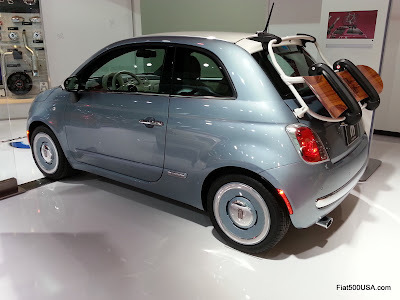 Fiat Live from 2013 LA Auto Show! While you are waiting for the event to begin, make sure you check out the links below to get up to speed on all the new 2014 Fiat 500 models. * The presentation is over, but we'll see if we can get highlights and re-post them here for those who missed the preview. 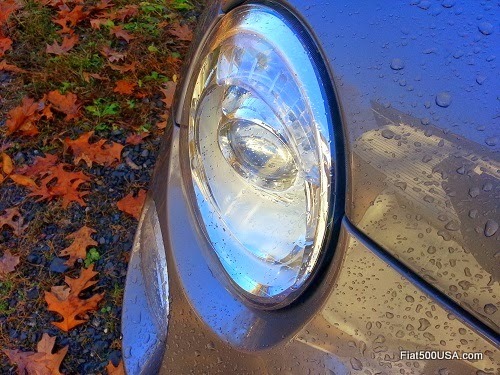 Occasionally you may notice the head lights or tail light assemblies on your Fiat 500 fog up or have condensation on the inside of the lens. The question then comes up if this is normal or indicative of a problem in the lamp's sealing. We'll take a look at the official way of evaluating this concern so you know if you have a problem or not, and save you the inconvenience of an unnecessary visit to your Fiat Studio's service department. 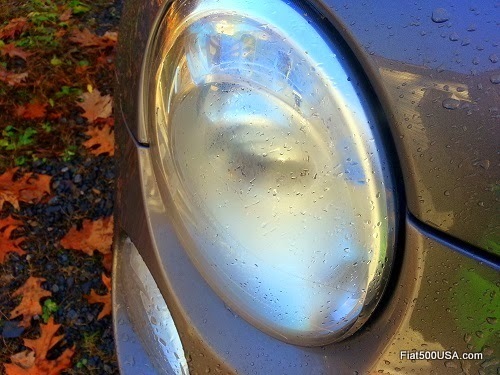 The inside lens of an exterior lamp can fog with a layer of condensation after you turn off the lights, and the lamp has been rapidly cooled by cold water, such as rain or a car wash, etc. Depending on atmospheric conditions, you may also notice in the morning the lens has fog after the car has been parked outside overnight. This is common when the previous day was warm and humid followed by a clear, cool night. This will normally clear up once conditions allow the condensation to change back into a vapor. Turning on the lamps typically speeds up the process. If you are concerned there is a problem, though, here is how to tell. First, park your car inside and dry all water from the outside surface of the lens. Then operate the lamps for 20 minutes. If the condensation/fogging has begun to clear from the lamp lens after 20 minutes with the lamps operating, this indicates the lamp sealing has not been breached, and the lamp does not need to be replaced. If the condensation/fogging has not begun to clear after 20 minutes with the lamps operating, or the lamp has large amounts of water droplets visible on most internal surfaces, this shows there is an issue with the lamp sealing that has allowed water to enter the lamp. Typically when that is the case, moisture in the lamp will always be present and will never seem to disappear. A lamp that exhibits internal moisture permanently should be replaced. Fiat is unveiling a new special edition of the Fiat 500 at the LA Auto Show next week. 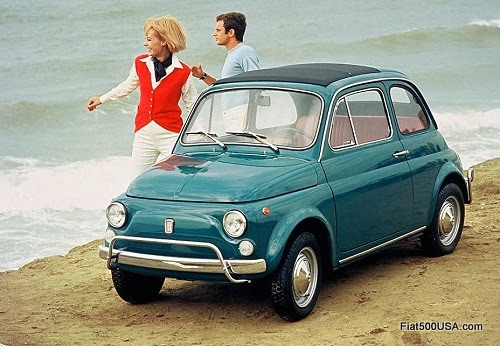 Called the Fiat 500 “1957 Edition," the car celebrates the Nuova 500 model that premiered on July 4, 1957. It's a modern interpretation of the iconic model produced between 1957 and 1975. The new Fiat 500 “1957 Edition” is based on a Lounge model and available in three vintage looking colors - Bianco (white), Verde Chiaro (light green) or Celeste (celestial blue). The last two colors come with a Bianco painted roof and mirror caps for an authentic retro look. 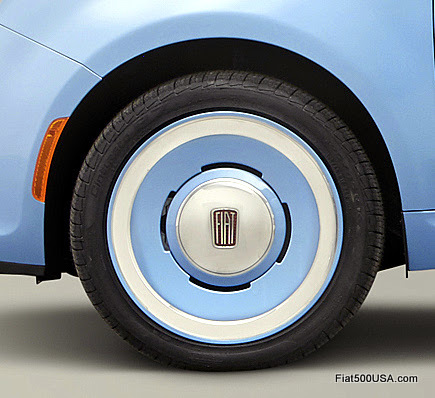 A new 16 inch wheel designed to resemble the steel wheels used on 1950 era Fiats sets off this special edition 500. These wheels made their first appearance on the Fiat 500 Beach Cruiser concept shown at last year's SEMA show and the Mopar concept car earlier this year at the Detroit auto show (sharp eyed Fiat fans will recognize the "1957 Edition" as looking nearly identical to the car on display at Detroit - see here). A sport tuned suspension makes the 1957 Edition a nimble handler, just like the original. Inside is furnished in Marrone (brown) and Avorio (ivory) leather, which is lavished on the seats and hand stitched steering wheel. Grey door panels have Avorio inserts with Marrone armrests, and there is a six-speaker, 276-watt premium audio system with SiriusXM Radio. The interior and exterior are finished off with period correct Fiat badging. 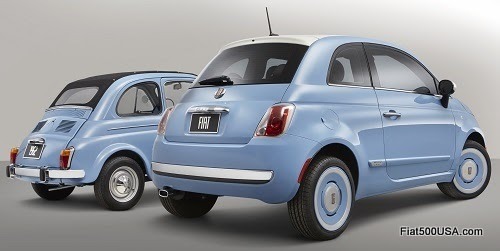 Fiat Studios will be able to order the Fiat 500 "1957 Edition" early 2014 with deliveries beginning in Spring. Pricing is yet to be announced. We'll have that news for you as soon as it is available. 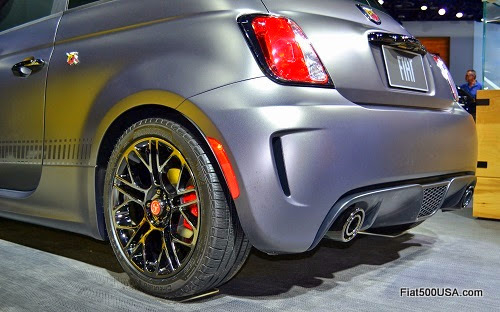 New Fiat 500 Abarth Wheel Available! 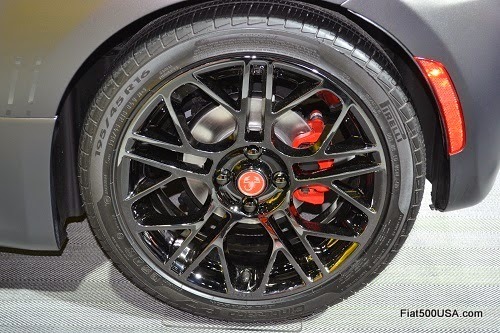 A new 16 inch alloy wheel option is available on 2014 Fiat 500 Abarths. 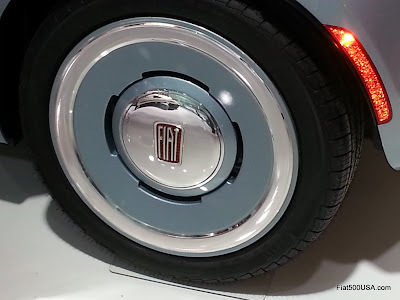 The new Hyperblack Cast Aluminum Wheel first made its appearance on the 500 Abarth Tenebra concept car shown at the Detroit Auto Show this past January. The attractive 16 inch wheels are 6.5 inches wide and are shod with 195/45R16XL Pirelli P7 tires. This optional wheel is priced at $550. As is the yearly tradition, Fiat and Mopar have teamed up to put together some wild looking concept cars for display at the 2013 Specialty Equipment Market Association (SEMA) Show in Las Vegas, Nov. 5-8. These custom Fiat 500Ls show what you can do with some creativity, craftsmanship and Mopar accessories. 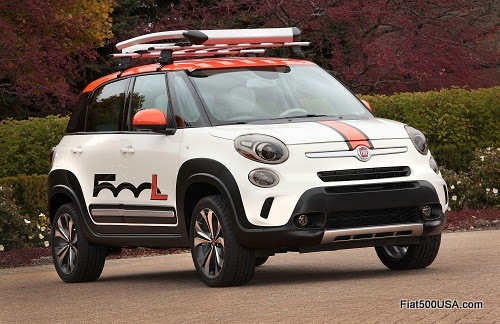 This year the folks at Mopar, the parts and accessories division of Fiat-Chrysler, are highlighting the versatility of the four-door Fiat 500L with two concept cars. The first is called the Fiat 500L Adventurer, a rugged go anywhere looking vehicle loaded with ideas and accessories that will get the creative juices flowing in any 500L owner's mind. 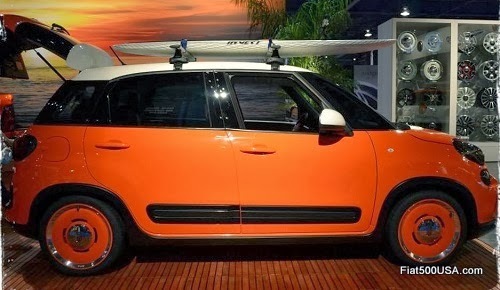 The other is the Fiat 500L Thalassa, a fun in the sun surf vehicle that picks up on last years Fiat 500 Beach Cruiser concept car. 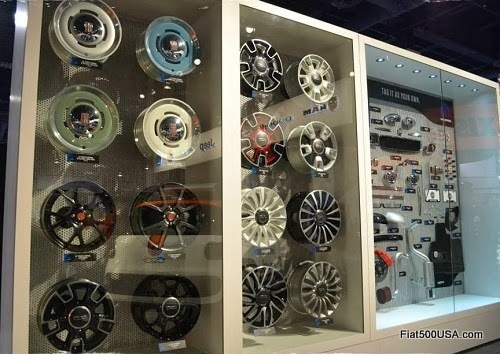 Some of the ideas and design proposals shown at SEMA do make it into production and fans of last year's Beach Cruiser will be happy to know the wheels from that car are now available through the Fiat parts and accessories catalog. The following is the official description of each Fiat concept car, courtesy of Chrysler Media, plus links to read about all the other Fiats shown at SEMA over the years. The Fiat 500L Adventurer illustrates the versatility of the new five-seater, with modifications that transform the vehicle and equip it with a tough, rugged appearance. The exterior is enhanced with bright white body paint, two-tone accent wheel flares and rockers painted in Satin Black. Color is added with Vibrance Bright Orange on the roof, which totes Mopar roof rails and a large roof basket. The vehicle sits on 18 x 7.5-inch custom concept wheels embellished with FIAT logo center caps. A custom 500L graphic augments door panels, with the L painted orange to match the roof. Orange mirror caps, tinted taillights, tinted chrome exhaust tips, molded splash guards, and a chrome FIAT logo ring further enhance the exterior styling. The interior is upgraded with black perforated suede Katzkin seats and Katzkin pearl leather seatbacks. Matching orange accents are featured inside as well, with orange-painted bezels and orange accents surrounding the speaker grills and steering-wheel badge. The two-tone instrument panel is black with a white leather insert. A Mopar seat back coat hanger, all-weather mats, a pedal kit, door-sill guards and a cargo organizer are included from the Mopar catalog. A performance boost is achieved with a Mopar cold-air intake and Mopar cat-back exhaust. 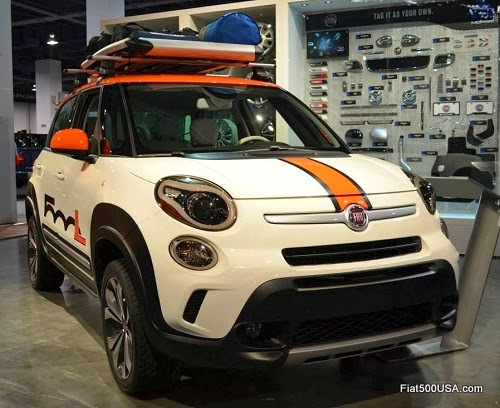 If the Fiat 500L Adventurer represents the “turf” in the FIAT presence at SEMA, the “surf” is served up by the Fiat 500L Thalassa, a variation on the Fiat 500 Beach Cruiser that was shown at the 2012 SEMA Show. 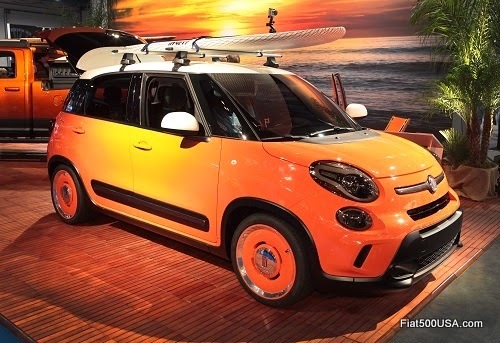 Proving that what Mopar develops as a concept one year can become a production part the next, the Fiat 500L Thalassa features new 18 x 8-inch “Beach Cruiser” wheels — a production version of the steel wheel introduced on the Fiat 500 Beach Cruiser last year. 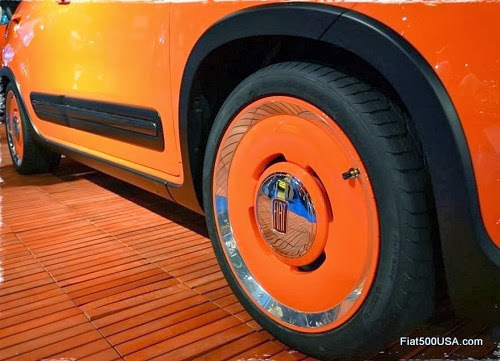 The wheels, decorated with chrome ring accents, are painted to match the Vibrance Bright Orange body color and carry FIAT retro-badged center caps. On top, Mopar roof rails support a long roof basket — perfect for transporting a surfboard to the beach. The roof is covered in bright white, as are the mirror caps. A lowered ride height and smoked lenses and trim provide an aggressive, sleek appearance. Inside, Mopar installed a unique towel-drying rack to fit in the rear compartment, with a unique water-protecting cargo organizer that houses wetsuits and a water jug for an impromptu street shower. Another original feature is wetsuit material integrated into the seat construction, along with Katzkin charcoal leather bolsters paired with Alcantara leather and dual Katzkin white leather stripes that run down the center of the seats. Feeding off the Vibrance Bright Orange exterior, Katzkin orange accents further elevate the interior, including a Katzkin tangerine armrest, door panel inserts, dash bezel, and Katzkin tangerine stitching on the border of the front and rear seats, steering wheel and shifter boot. 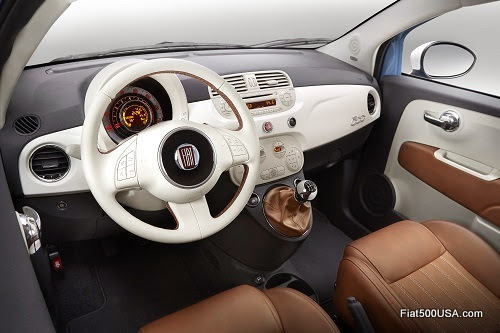 A classic FIAT badge on the steering wheel provides a retro touch. A pedal kit and sill guards complete the interior, with a Mopar cold-air intake and a Mopar cat-back exhaust enabling the beach vehicle to kick up a little more sand. Using the ProMaster H2 (High Roof) as a starting point, the Ram ProMaster demonstrates its potential versatility as a mobile garage and a weekend race-support vehicle. The exterior pledges its allegiance to Team Mopar, with white body paint dressed up with unique Mopar graphics, including the Mopar Performance logo in grey and a Mopar Blue stripe. 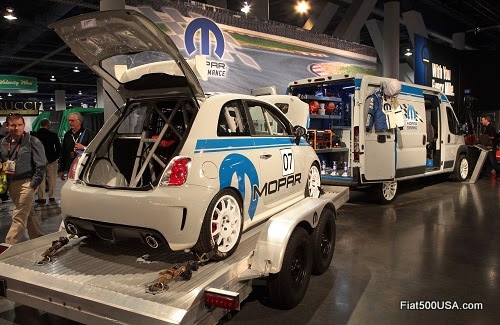 The ProMaster leads the way to the racetrack, pulling a Fiat 500 race car and trailer with the assistance of a Mopar hitch receiver and trailer-tow wiring harness. Unique wheels transport the ProMaster, matching the paint and design of the race-car wheels. Heavy-duty splash guards at the front and rear protect the ProMaster, and a Mopar Design badge adds flair. The spacious cargo compartment of the ProMaster carries critical elements needed to assist a racer during weekend battles at the strip or the circle track. PSE toolboxes, bins, spare tires and other vital race equipment fill the cargo area, which is customized with Mopar Blue accents to drive home the Mopar “rolling garage” interior theme. To brighten up the cargo compartment and help locate equipment, cargo-area lighting is utilized, and a rear-cargo liner helps protect the bed from wear and tear. The ProMaster is also upgraded with a power inverter, WiFi and the Electronic Vehicle Tracking System (EVTS). Up front, the seats receive the Katzkin treatment, with frost leather on the main seat area, surrounded by Katzkin charcoal leather, and the Mopar Blue logo embroidered on the head rests. Mopar Blue stripes, like those on the exterior, accent the inside door sills. Here are just some of the accessories that are available for your Fiat at your dealer. Whether you have a 500 hatch, Cabrio, Abarth or 500L, Mopar has you covered! Fiat 500 Year End Sales Incentives Kick Off! If you have been looking at a Fiat 500, now is the time to buy. Aggressive model year closeout dealer incentives start today! This is breaking news and dealers are just now finding out the details as I write this, but expect fantastic lease, finance and purchase deals to be available. All 2013 Fiat 500, Cabrio and Abarth models are eligible as Fiat Studios have been given the order to clear the lots to get ready for the 2014 cars. If you have your eye on the four-door Fiat 500L, dealers also have incentives on those, too. Now that the year is coming to an end, Fiat is pushing hard to finish off on a high note, so take advantage before the 2013s are all gone. Make sure you give the Fiat Studios listed below a call to see what deals they have going on. The first five Alfa Romeo 4C 'Launch Edition' cars were delivered to customers Thursday, October 31, at the Alfa Romeo Balocco test facility in Vercelli, Italy. The 'Launch Edition' is a limited run of the 4C supercars that come complete with a carbon fiber aerodynamic kit (including headlights, spoiler and door mirror covers), dark finished aluminium rear extractor, Bi-LED headlights and 18" (front) and 19" (rear) alloy wheels. Alfa Romeo 4C 'Launch Edition' cars are available in 'Alfa Red' or exclusive matt 'Carrara White' and have an engraved numbered plate noting the car is 1 of 500 made. The five lucky customers, hailing from Switzerland, France, Germany, the Netherlands and Italy, signed up for their 'Launch Edition' at the 83rd International Motor Show in Geneva on the day the order books were officially opened. The ceremony was held at the former Autodelta workshops at Balocco, where every Alfa Romeo has been developed and tested since 1962. At the event was Louis Carlo Vignon, Head of Alfa Romeo Brand EMEA, and Alfa Romeo 4C Chief Designer Alessandro Maccolini. Owners were treated to fast laps in the car driven by Nicola Larini, a renowned German Touring Car Champion from the past. The five Alfa Romeo 4C 'Launch Edition' owners were given a close-up look at a 33 Stradale, a car often cited as being one of the most beautiful coupés of all times, and the inspiration of the new 4C. As for potential North America owners of the Alfa 4C, they will have to wait until the middle of next year to get their hands on the car. Where these buyers will be purchasing their cars has been in question ever since Harald Wester, CEO at Alfa and Maserati, let slip in an email to Automotive News that the 4C will be sold at Maserati dealers in the US. 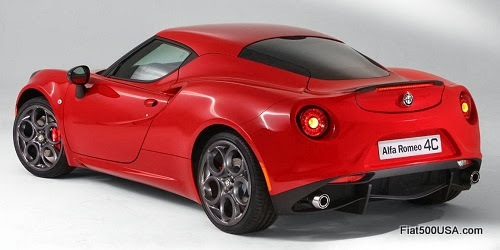 There has been no confirmation from the company that Fiat Studios will also get a crack at selling the 4C, much to the consternation of US Fiat dealers. 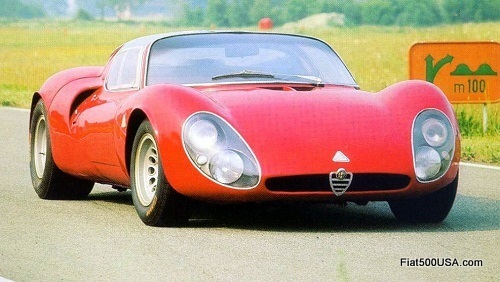 Future plans for Alfa Romeo remain a closely guarded secret, but there is talk that Fiat will be investing a considerable amount of Euros into developing a rear wheel drive platform for the legendary marque so they can compete on equal terms with the German car makers. Sergio Marchionne has high hopes for Alfa Romeo sales, the last projection made in 2012 was 300,000 cars by 2014. With only the Giulietta, MiTo and 4C to sell, that surely will not happen, so we are expecting a revised sales goal to be set at the end of the next year's first quarter. If Alfa is to succeed in achieving the significant numbers Marchionne is envisioning, that will mean that many of Fiat's 210 dealers in the US will have to be onboard selling the marque. That should give Fiat dealers some hope while they wait for the official announcement. Overall Fiat 500 sales for October were up 16 percent over September, helped by the 500L recording its best sales month yet since its introduction in June. Fiat sold a total of 1296 4-door 500Ls, or 26 percent more than the previous month. Sales of 500 hatchbacks, Cabrios and Abarths were also up 12 percent over September, but are still running significantly below last year's sales.The downward sales trend began in June, coinciding with the 500L's introduction and are currently averaging 30 percent off of last year's sales. When asked, Fiat dealers talk about the lack of year end incentives when compared to last year, no 2014 models available yet and no automatic transmission for the high powered Abarth and 500 Turbo models. Dealers also mentioned that 500L sales have been hampered by an uneven product mix, with low availability of popular colors and long lead times getting vehicles. Recent news of a shutdown at the 500L factory in Serbia due to a transport workers strike will not help availability. 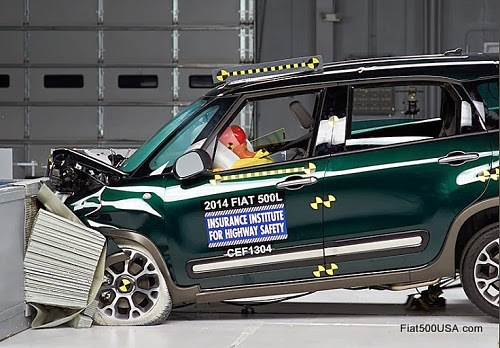 The Fiat 500L was tested by the IIHS and was awarded a Top Safety Pick in October. Still, overall sales of the Fiat 500 are running even with last year's, but it is obvious an injection of excitement needs to be done to get the ball rolling. Seeing the 2014 models finally coming in, hopefully with an automatic transmission for the 500T, would be a great start. 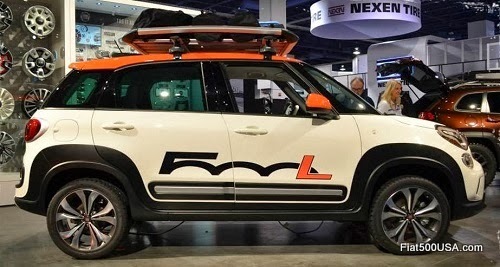 Fiat Gets Ready for SEMA: Fiat 500L to be Shown!